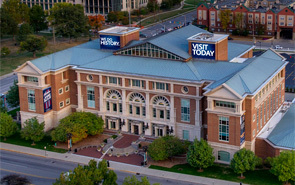 You'll love the Eugene and Marilyn Glick Indiana History Center on the Canal in downtown Indianapolis! Check out our latest exhibit! Learn about the experiences of early residents and how they grappled with pivotal and ongoing issues of freedom, equality and faith. Did you know traveling preachers, known as circuit riders, spread religion on the frontier? Learn about National History Day in Indiana! 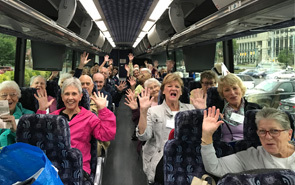 Our members enjoy exciting benefits like day trips that showcase the rich heritage of Indiana. Tuesday through Saturday10 a.m. to 5 p.m.
Indiana Experience Admission Free IHS MembersFree Children under 5$9 Adult$8 Seniors 60 and older$5 Youth ages 5 through 17 Free parking with admission in lot off New York. IHS serves all of Indiana. Connect with statewide offerings and services. Our efforts to connect people to Indiana’s past stretch throughout the state, from traveling exhibits and collaborations to grants and training. We also support Indiana’s local, county and regional historical societies, museums, and sites in their important work. Grants are available for projects that will help Indiana’s local history organizations meet high-priority needs in areas of capacity building, collections stewardship, innovation and collaboration. We assist local organizations in their work to promote and preserve Indiana's history. Connect with local history contacts in your area, including your official County Historian. Check out our special exhibition that travels around the state in a 53-foot, double-expandable semi trailer. It may be heading your way soon! It traveled around the state for years, now finding its home at the Indiana State Fairgrounds. We have a variety of exhibits that travel the state. Catch one in your community.